At Neocate, we get a lot of dirty questions from new parents starting on Neocate products. By dirty we mean, questions about dirty diapers and baby poop. In this post we’ll walk you through some of the most common questions related to what’s in your little one’s diapers – poop, bowel movements, poo, stool. We will tackle the questions that you might be too shy to ask. What is a normal baby poop? What color should poop be? Will baby poop change after starting Neocate? We’ll also go over the reasons you see what you see, because new parents ask why. If we don’t answer your question in this blog post, don’t hesitate to comment below. Remember: we’re Neocate experts: we can’t give medical advice and we can’t answer questions about your little one’s medical care. Please contact your healthcare team for these types of questions. 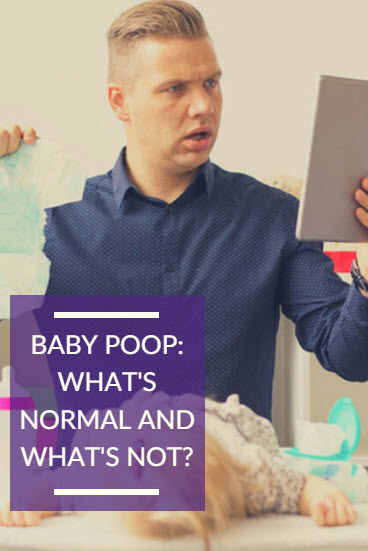 WHAT IS NORMAL WHEN IT COMES TO BABY POOP? Parents pay close attention to their newborn’s stool. Anything that seems unusual can cause a lot of anxiety. So, what exactly is “normal” when it comes to stools? There’s no one answer that fits everyone. What’s normal for one baby may not be normal for another. Color, consistency and frequency of bowel movements can differ. It matters if a baby is breastfed or formula-fed, as well as the mom’s diet or the type of formula. Below are some general guidelines to help you with your diaper content-related expectations. WHAT COLOR AND CONSISTENCY SHOULD BABY POOP BE? Your baby’s first poop is called meconium. It begins within 12 hours of birth and will be black or greenish, and very sticky. Breastfed babies: An exclusively breastfed baby’s poop will be a light mustard yellow color and may have seed-like specks. The consistency of these stools can range from loose and runny to very soft. Formula-fed babies: A baby consuming standard (milk or soy-based) infant formula has stools that are often tan or yellow in color. A formula-fed baby tends to have firmer stools than a breastfed baby, similar to a peanut butter consistency. Neocate Syneo Infant babies: Babies on Neocate Syneo Infant often have stools that are soft, similar to those of breastfed infants. The color may be close to a light mustard color, again similar to breastfed babies’ stools. Babies on other hypoallergenic formulas: Stools may be green and are often pretty dark green. Consistency of these stools is often pasty (think peanut butter), sometimes loose and watery, or occasionally formed and hard. With most hypoallergenic formulas, like Neocate Infant, the stool color (green) and consistency (pasty) is due to the ways these special formulas are digested and absorbed. Keep in mind, in such formulas the protein is very broken down and simple to absorb, and they don’t contain fiber. Read more about green baby poop. However, with Neocate Syneo Infant, stool color and consistency can be different, more like those of breastfed babies. That’s because Neocate Syneo contains prebiotics and probiotics. These compounds are inspired by breast milk, and Neocate Syneo Infant is the only hypoallergenic amino acid-based formula that contains them. Important to remember: Regardless of whether your baby drinks breast milk or formula, blood in the stool is NOT typical. If you see red in the diaper or the stool looks black, always let the doctor know. This can be a sign of a food allergy. If you spot mucus, which looks like what comes out of your nose and is sticky, a little bit can be normal. If you see a lot of mucus in the diaper for an extended period, it can signal a food allergy. If this occurs, please contact your doctor. Green: More common if you are on an amino acid-based formula, like Neocate Infant. Orange or Yellow: These colors are most common when breastfeeding, feeding Neocate Syneo Infant or once you start introducing baby foods like those colorful strained carrots. White: Call the doctor. The chalky color could indicate there may be no bile from the liver to digest the food, which needs to be addressed right away. Black: Consult the doctor. Tarry black poop may be a sign of blood in the digestive tract that has turned dark black while moving down the intestines. Bloody stool can signal a variety of allergic/gastrointestinal conditions, including milk protein allergy. Red: Reddish poop could come from a colorful last meal if you’ve just started baby food (think beets). But if you see bright red blood in the poop, call the doctor right away. The frequency of baby poop can vary. Some newborn babies may have a bowel movement after each feeding. Others may only go once a day or even once every two days. During the first weeks of life, until you learn your baby’s bowel habits, common advice is to call the doctor if your baby goes three or more days without a bowel movement. Breastfed babies: Breastfed babies usually poop a lot before they reach the one-month mark. After the first month, breastfed babies often have fewer bowel movements than before. On average ranging 3-4 times per day. Formula-fed babies: Formula-fed babies typically have one or more bowel movements a day. Neocate Syneo Infant babies: If your baby takes Neocate Syneo Infant, stool frequency may be once a day or even a little less frequent. Babies on other hypoallergenic formulas: It’s normal for bowel movements to decrease in frequency if you switch to one of these formulas without prebiotics. Regardless of whether your baby drinks breast milk or formula, as long as the baby is healthy and growing, infrequent stools aren’t cause for concern. If the baby seems to have trouble passing them though, call the doctor. The body digests and absorbs hypoallergenic formulas like Neocate differently than standard formulas. That can mean a difference in stool consistency, and may result in looser stools for the first few days as the body adjusts to Neocate. Most experts suggest that it can take about 2 weeks to adjust to a new formula to find your “new normal.” This also allows enough time to see most of the benefits of Neocate on signs and symptoms of food allergies. Keep in mind that at times, newborn’s stools may be soft and slightly runny, making it difficult to tell if they have diarrhea. A significant increase in frequency or an extremely liquid bowel movement are signs to look for. Diarrhea can cause dehydration, so if you are concerned your baby might have diarrhea, call the doctor. Many parents get concerned when they don’t see a bowel movement in a day or two after starting Neocate. That’s not unusual for infants on hypoallergenic amino acid-based formulas. With most hypoallergenic amino acid-based formulas, like Neocate Infant, babies poop less often due to the ways these special formulas are digested and absorbed. The protein in such formulas is broken down and simple to absorb, and they don’t contain fiber. However, with Neocate Syneo Infant, babies may have stools more often than with other hypoallergenic formulas, more like breastfed babies. Neocate Syneo contains prebiotics and probiotics. These compounds are inspired by breast milk, and only Neocate Syneo contains them. Regardless if your baby is breastfed or formula-fed, hard or dry stools that are difficult to pass may indicate constipation. Some parents tell us that their little one seems to be straining, trying to have a bowel movement. That can happen sometimes with formula, but it could also be unrelated to the formula. If your little one looks uncomfortable it’s best to check with her healthcare team. Sometimes the solution is as simple as providing additional fluids. Other times, the doctor will look at other ways to make it easier for your baby to pass bowel movements. HOW MANY DIAPERS SHOULD I BE CHANGING A DAY? The answer to this question is related to the question above about constipation. First, you’re still going to have to change diapers that are wet with no bowel movement. Many, if not most, parents say that when their little one switches to Neocate Infant, they may change fewer dirty diapers, and most diapers they change are just wet from urine. If your little one hasn’t started solids yet, you might notice him start to have more dirty diapers when you start to add solid foods into his diet. Just kidding. We’d love to say that these are all the questions we get about Neocate and diapers, but we’ve only scratched the surface – we could write loads on this topic! If you don’t find your answer here, please ask your question below. That way other parents who are just as curious can see the answer. Tell us, what else do you want to know about Neocate dirty diapers? health care professionals around the world. If your child is allergic, breastfeeding could be difficult and you may need support.